Warm Florida sunshine and ocean breezes are calling! 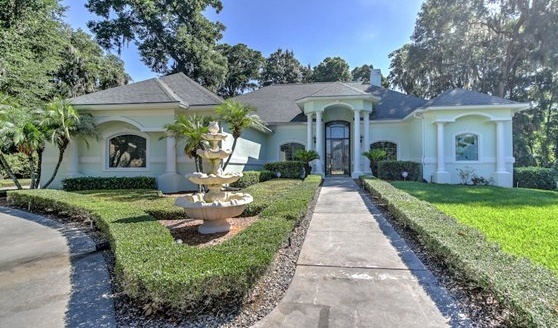 MilitaryByOwner’s Home of the Week is a stunning property near MacDill AFB in in Valrico, Florida. Come along for a little window shopping and take a tour of this gorgeous home! A quiet cul-de-sac with only nine homes awaits the new owners of this property on Cinnamon Trace. There, a formally landscaped yard welcomes all who walk through the grand arches of the front porch and enter through a custom 10-foot stained glass door. The foyer makes an impressive statement with 12-foot ceilings and showcases the beginnings of stately crown molding that is found throughout the home. 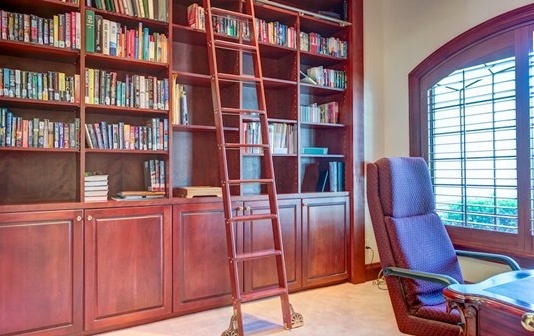 If a home is going to have a library/office, this is the one to have! Just like in the movies, a masculine built-in shelving unit comes complete with a ladder to assist with hard to reach volumes. Large windows allow for a flood of light, making reading stress-free. 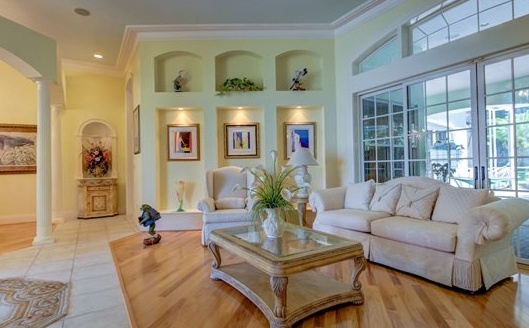 The flow of the main living area is breezy and airy, thanks to unobstructed open concept living. Entertaining is easy as guests mingle near the fireplace in the sitting room while others converse in the spacious living room. As the hosts prepare cocktails and hors d' oeuvres in a chef’s kitchen, guests will also enjoy each other’s company near the screened hot tub and pool, rain or shine, thanks to the covered lanai equipped with an outdoor kitchen. 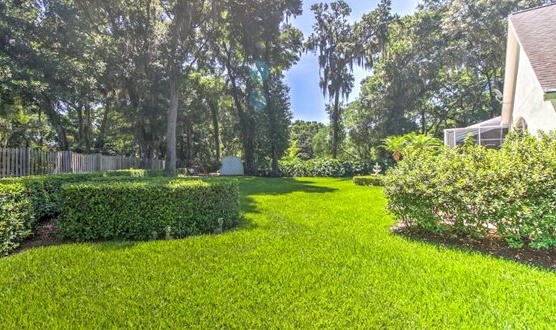 The rest of the backyard is an oasis of mature oak trees and pristine landscaping. Perfect for lazy days in the hammock. Tucked away, an ample shed equipped with electricity is perfect for a family member who enjoys woodworking. More storage is available within the three-car garage with raised floors. If your family still needs more room to store all of that military equipment, a usable attic is available. The current owners clearly adore their home and have lovingly attended to all of its detailed care. 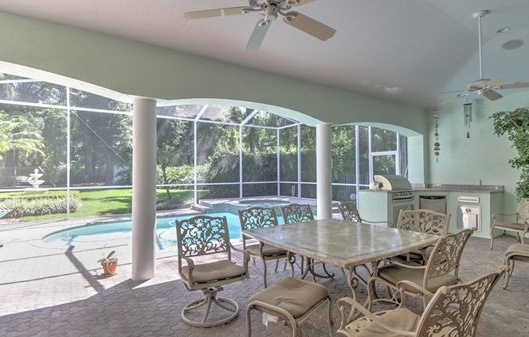 MacDill AFB is hub of activity, and this well-kept home will make a perfect retreat to get back to each night. 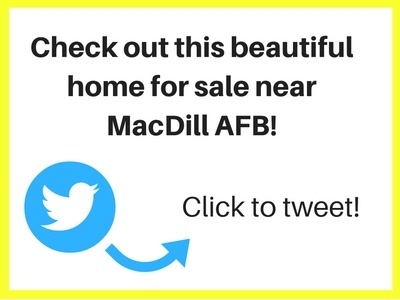 **Note: While this home is no longer listed for sale, view other homes for sale or rent in the MacDill area at MilitaryByOwner's MacDill base page. Sign up for MilitaryByOwner’s newsletter for more information about available properties.